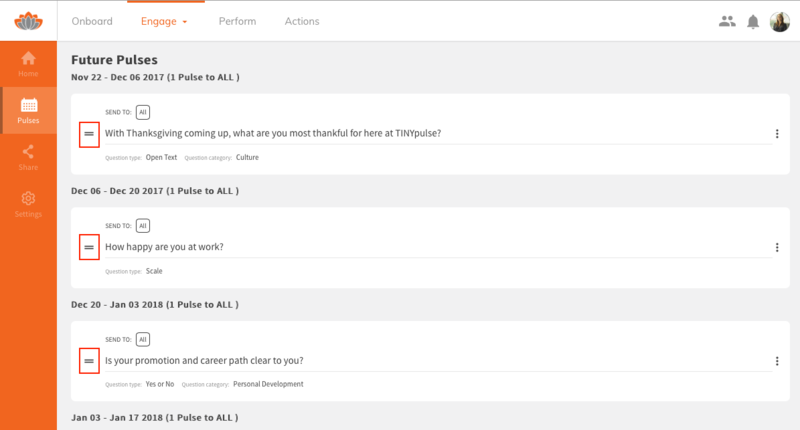 TINYpulse Engage makes it easy for you to ask the right questions at the right time. TINYpulse has a standard queue of questions which will be sent out for you, but you also have the flexibility to ask custom questions or choose another from the question bank. Plan weeks in advance so you can just sit back and watch the feedback roll in. 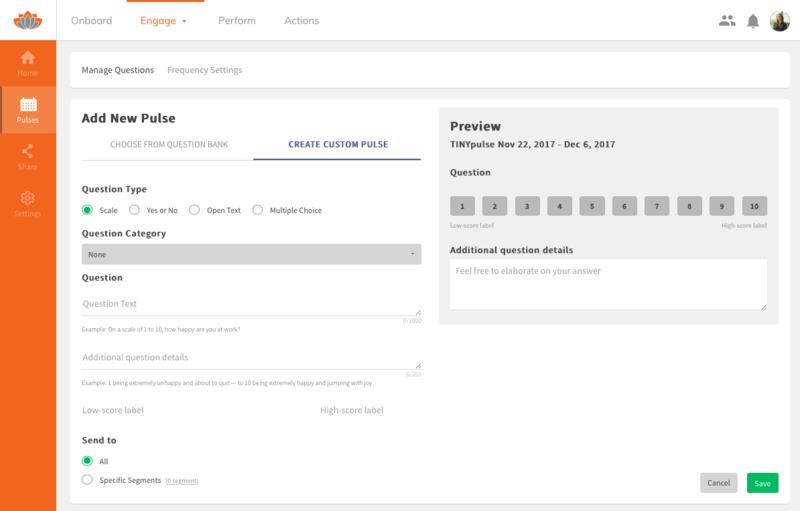 TINYpulse Engage lets organizations send one question pulse surveys every week, every other week, or every fourth week. Feel free to use the default question flow, ask your own custom pulses, or select a question from the bank. Here's a brief overview of each question type to help you decide the nest format for getting the feedback you need. Open Text: Respond by entering text only. These questions typically garner the lowest response rate, but often deliver some of the more valuable insights.Sample question: What's one thing we should try within the next three months to better serve our customers? Multiple Choice: Respond by selecting one option of up to ten. Multiple choice questions are only accessible as custom questions; there are no multiple choice questions in the bank. Sample: What do you believe is our organization's greatest strength? Customer service, Product, Innovativeness, Opportunities for growth, Other. Manage your next fifteen questions in the Pulses section of the Engage Dashboard. You can do things like update questions, ask a custom question, postpone a survey, and adjust question order by dragging and dropping questions. Update the wording of a question: Change the language or words of a question, without altering the meaning by clicking on the three dots and Edit to the right of the question text. This is a good option if you want to provide a translation for non-English speaking staff or adjust to Queen's English. Replace the question: If there's a question you don't like and want to remove entirely, select the Replace Pulse option to change that week's pulse to your own custom question or select a standard one from the bank. Delete a question: Click the Remove link to remove a question from the lineup. Sometimes there will be a question you just don't like or won't work for your organization. This option will remove the question entirely and adjust the entire queue up one week to fill in the gap. Postpone a question: Sometimes you'll need to skip questions if it's a national holiday, you need more time to process the last pulse's feedback, or for whatever reason. Just click the Postpone 1 Week button to pause the queue. The upcoming lineup won't be changed, TINYpulse will just ask the next question during the next survey. You'll get a confirmation with the date of the next pulse and also see the Duration field update in the upcoming question list. Resume pulsing: Postponed a question and having remorse? No worries, just click Resume and the survey will send out the next Wednesday. You'll also get a confirmation for the next survey date once you hit the button. Reorder Questions: Admins can easily change question order by dragging and dropping questions in the lineup! Just click down on the = icon on the left of the question to drag it to a new location in the queue. Adding a new pulse will insert it to the top of the queue to be sent out the very next survey day. From there, you can leave it or drag and drop it to a later date. Companies love that we handle all the planning, thinking, and delivery to gain insights, recognition, and suggestions from their staff. At the same time, these same companies encounter atypical situations like management changes, a move in location, M&A, etc. and would like to ask a customized question that pertains to these situations. Customized questions can also allow you to address your company's culture specifically, as each company will have their own unique cultural identity that may need particular questions to assess changes over time. To handle this, we've built in the flexibility to ask a custom question within the TINYpulse framework. 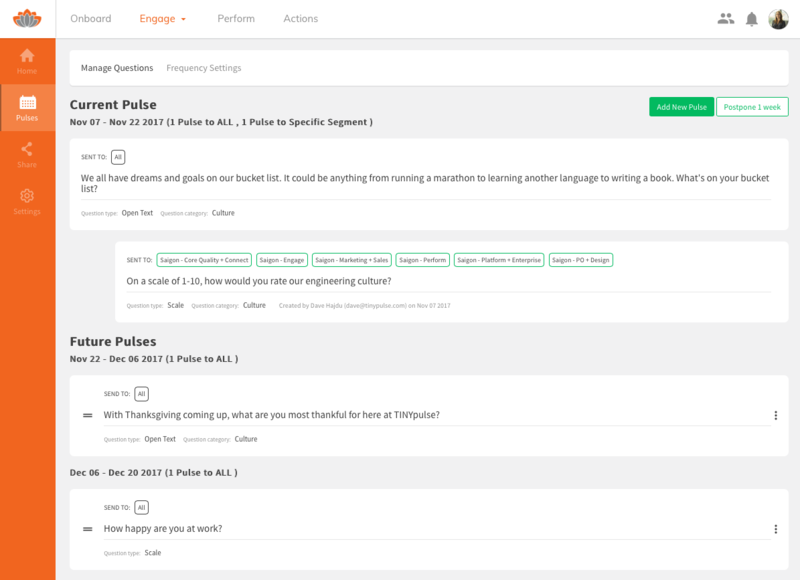 You can now ask your own question, just like a regular TINYpulse, to help you get the insights you need. Click on Add New Pulse to add a new question at the top of your queue. In the editor, Create Custom Pulse is the default option, so you're all set to continue. Choose the question category from the dropdown menu. Select the type of question you'd like to ask: scale, boolean, open text, or multiple choice. Write your question and provide any additional details if needed. For scale questions, enter the low and high score labels. Some examples include, strongly disagree/strongly agree, never/always, etc. For boolean questions, you'll have to enter the positive and negative options like yes/no, absolutely/no way, etc. The possibilities are endless for multiple choice questions! Add up to ten response options for each multiple choice pulse. Specify who should receive the pulse, either all employees or just those from specific segments. Learn more about pulsing employees from specific segments. Click Save and the question will be added to the top of the list and will be sent out once it's time for your next TINYpulse survey. Click on Add New Pulse and change the option to Choose from Question Bank. Narrow down questions by selecting an option from the Question Category dropdown menu. Otherwise, browse through all available questions by going directly to the Question dropdown. Specify who should receive the pulse, either all employees or just those from specific segments. Learn more about segment pulses. If you'd like to reorder future pulses, just click the = icon on the left of the pulse card to drag and drop it to a new spot in the queue. As you're deciding on your TINYpulse survey frequency, make sure you understand the survey schedule along with the cadence of reminder emails so you can communicate them to your team. TINYpulse surveys open on Wednesdays at 10:00am by timezone. There is a way to adjust the time the survey is sent, but the day is fixed to Wednesday. Employees can either log in to their LIVEpulse account or wait for the survey email to be delivered to their inbox around the same time. If the receiver doesn't respond to the survey immediately, a reminder email will be sent just so they don't forget. See the timetable below for the exact timing and examples of each. Example: Survey arrives on Wednesday May 3rd, reminder arrives on Monday, May 8th. The next survey is delivered on Wednesday, May 10th. Example: Survey arrives on Wednesday, May 3rd, first reminder arrives on Wednesday, May 10th, the second reminder is sent on Monday, May 15th. The next survey is delivered on Wednesday, May 17th. Example: Survey arrives on Wednesday, May 3rd, the first reminder arrives on Wednesday, May 17th, the second reminder is sent on Monday, May 29th. The next survey is delivered on Wednesday, May 31st.